I think I heard the owner of Nickel was owned by the same grumpy lady in Banquet who was sometimes a little scary. Maybe she should close Banquet and focus on Nickel, because it is so obvious that Nickel is so much better as a food business. 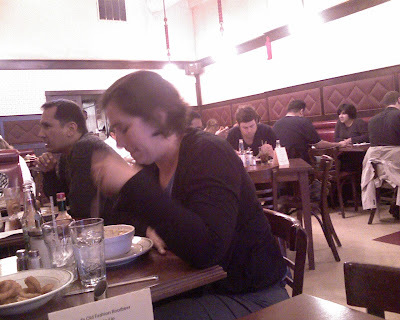 If Nickel is a work of passion as a diner, Banquet is probably a work of inertia as a wine bar. Jeez, finally there's somebody who can cook on this block! Everybody has tried Nickel. I heard all the complaints about the notorious 1-hour wait and discriminatory services against single guests. But the crowd waiting outside of it at 11:45AM on sundays is obviously an impressive exception for this kind of economy. Can't beat that. I guess I got lucky. Everything during my visit was pretty good from what I remember. 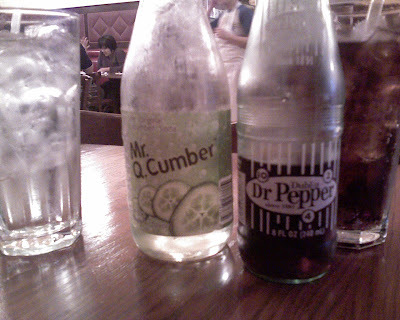 I loved the yummy cucumber soda in particular. It was very refreshing and not that sweet. Wanna find out where I can buy in bulk and stock up at home. 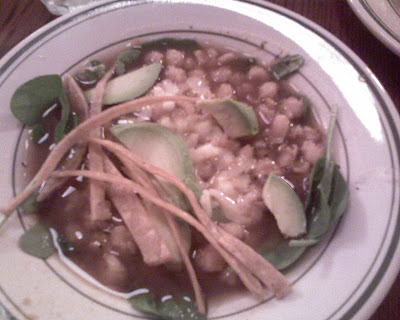 The vegan chili with avocado and soy cheese was awesome. The base was very thin, making it more like a soup than a paste. It was very favorful, not like any of the usual disgusting sweet, oily and sticky chili with cheddar at all. Order a large one at $6 if that's already your lunch / dinner. The $4 would be enough only as a starter if you order another entry. 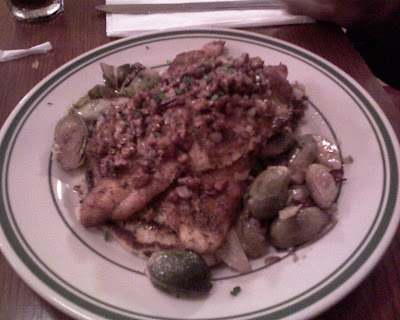 The catfish with corn cakes underneath was a piece of art. The pecan sauce was so tasty! The fillets were a little crusty on the surface with herbs and pecan sprinkled all over. I am definitely going to experiment it at home. I love cooking catfish. It has a good rich, smooth and thick texture with enough fat but does not come with an overwhelming favor. I like making Chinese congee with catfish nuggets when I am sick or marinate them and bake them for an easy toaster oven meal. But my super picky pescatarian boyfriend never touched my catfish before. Guess what? He had a bite of Nickel's pecan catfish and sighed that if I could cook that well, he would marry me. Well, what about if he could cook that well, I would marry him? Huh?! I can't believe he ate some of the bacon brussel sprouts on the side. He would claim he didn't but I was pretty sure there was some bacon on his fork. Bleh. The dish was pretty big. I suggest to eat all the fish and get the corn cake to go if you can't finish all of it. The fish becomes harder and dryer if you microwave it afterwards. As for the crowd, honestly, I have no idea, and I really don't care. It's definitely not a place to meet people. That's for sure. The decor was okay-cool but all color-coordinated so I don't know how much of it is original of the building. I was just there for the food.